Damian Lillard of the Portland Trail Blazers drives against D’Angelo Russell of the Los Angeles Lakers during a preseason game Oct. 19 at the Staples Center in Los Angeles. We’re inaugurating our NBA player projection system, CARMELO, with 2015-16 season previews for every team in the league. Check out the teams we’ve already previewed here. Learn more about CARMELO here. The Portland Trail Blazers have suffered a dramatic reversal of fortune fueled by injury and betrayal. After a feel-good run in the 2014 playoffs, they leapt out to a 41-19 record to start the 2014-15 season. Then Wesley Matthews injured his Achilles, and the Blazers finished the season 10-12 before falling to the Grizzlies in the first round of the playoffs. Matthews, LaMarcus Aldridge and Robin Lopez all opted to leave in free agency. With Nicolas Batum traded to Charlotte, Damian Lillard is the only starter returning. Two of those spots will be filled by new arrivals Al-Farouq Aminu (forward coming from Dallas) and Mason Plumlee (center from Brooklyn), and two will be former reserves Meyers Leonard and C.J. McCollum. 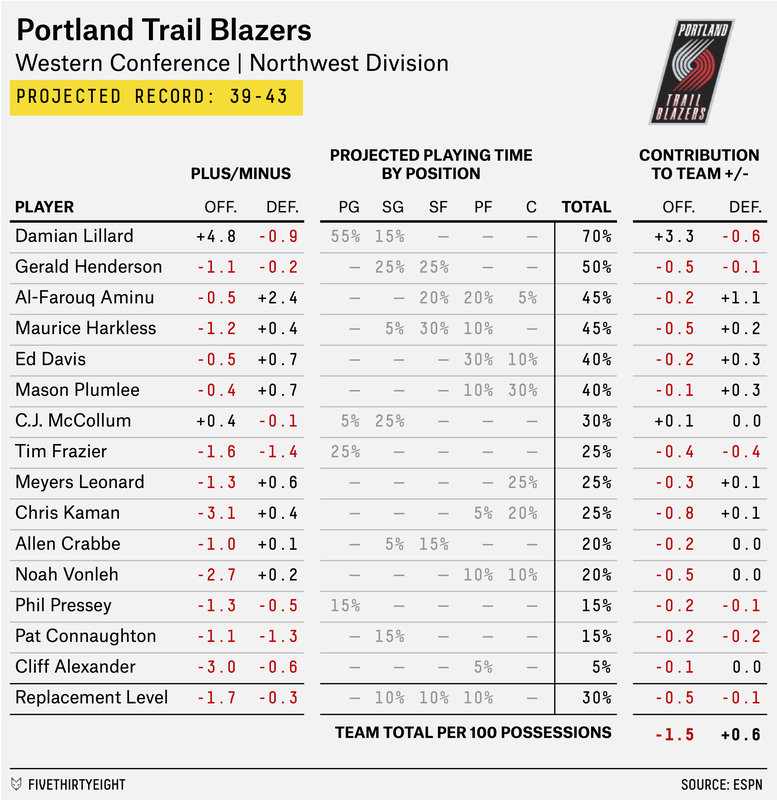 This makes the Blazers’ fortunes extremely hard to predict: Players’ performance changes a lot when they change teams or roles, and a point guard’s performance is particularly sensitive to teammates (much like a quarterback in the NFL). I’m sure NBA data nerds everywhere are excited to see what happens. 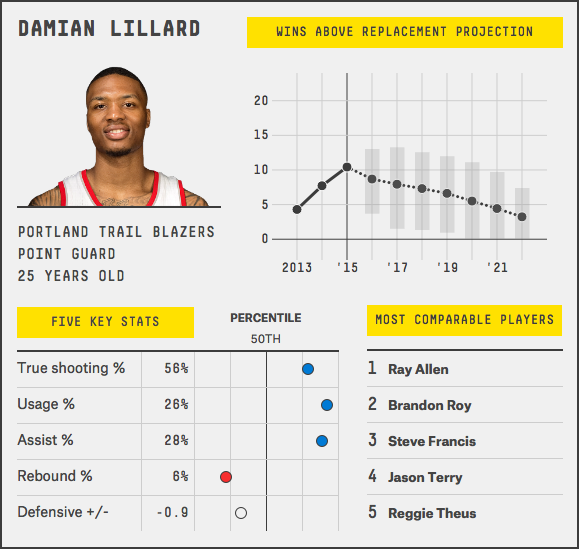 Damian Lillard is a legit star, and we’re still not even sure how good he is. ESPN’s Real Plus-Minus (RPM) rates him as the 13th-most valuable player and fifth-most valuable point guard in basketball. As you can see in his CARMELO chart, he has been improving every year — so rapidly, in fact, that the model expects him to regress this season. His production could shift radically with a new supporting cast — in either direction. At this point, however, I would say his upside is limited if he doesn’t improve his good-but-not-great 3-point shooting. He shot 34.3 percent last year from behind the arc, bringing his three-year average down to 36.8 percent, comparable to Chris Paul’s 36.4 percent. But Paul also gets double-digit assists (Lillard averages around six) and has led the league in steals six times. 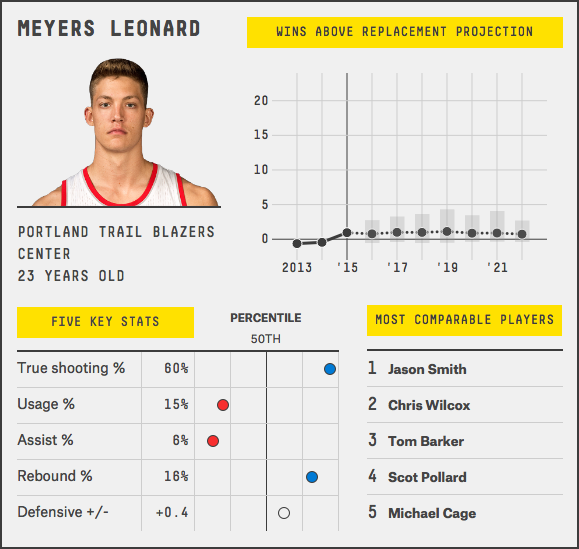 Meyers Leonard is a young 7-foot-1 “stretch” center, who supposedly had a breakthrough campaign last year. But I don’t really get it. He averaged 15 minutes and had a negative RPM. It’s impressive that he has shot 42 percent over 112 3-point attempts, but I’m more worried that he got only 32 free-throw attempts. That’s 1.4 free-throw attempts per 36 minutes. Compare that with Aldridge, who had 5.2 FTA per 36 minutes, or a true “stretch” big like Dirk Nowitzki, who isn’t exactly known for pounding the rock and still had 4.6 FTA/100. Even a non-offensive center like Tyson Chandler averaged 3.4 FTA/36 last year for Dallas. (Note also: Small sample, but the Blazers went 1-7 in games Leonard started last year). 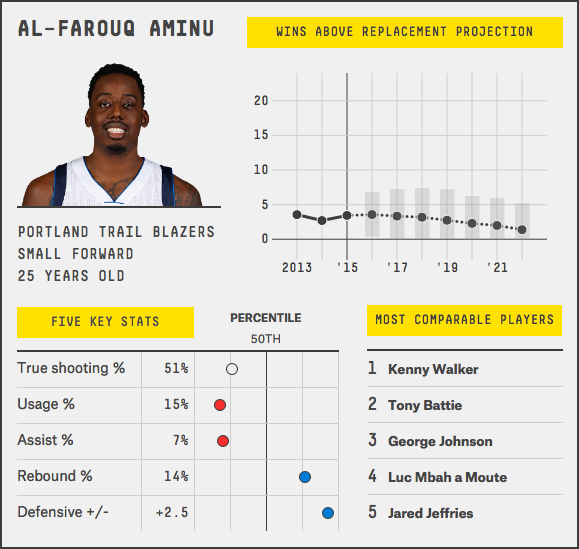 Al-Farouq Aminu played mostly as a reserve last year for the Dallas Mavericks. The No. 8 pick in the 2010 draft, Aminu will be playing for his fourth team in six years. Despite playing fewer than 20 minutes a game and being a dreadful shooter (28.6 percent on 3-pointers), Aminu grades out fairly well. His wins above replacement of 4.3 ranks 16th among small forwards, largely as a result of his fifth-ranked Defensive Real Plus Minus. As long as the Blazers are content getting their shots elsewhere, he could be valuable. 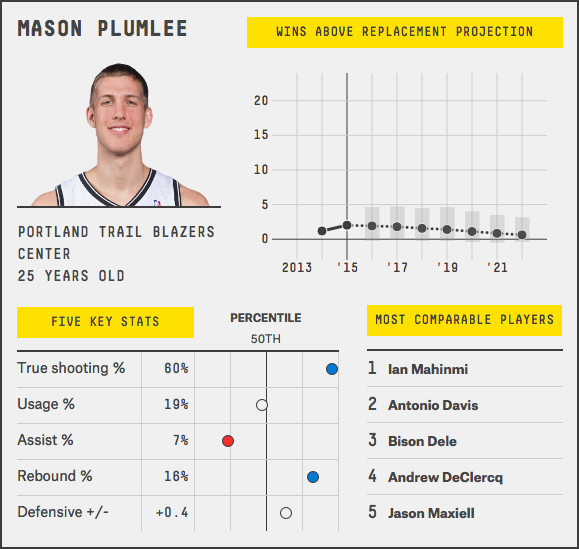 Rounding out the projected starters is Mason Plumlee, who averaged around 12 points and eight rebounds as a starter for the Nets while Brook Lopez was out last year. Real Plus Minus rates him as slightly below average on offense and slightly below average on defense, leading to an overall ranking of 47th among power forwards. Still, CARMELO and WAR are a little kinder, each giving him a couple of wins above replacement. 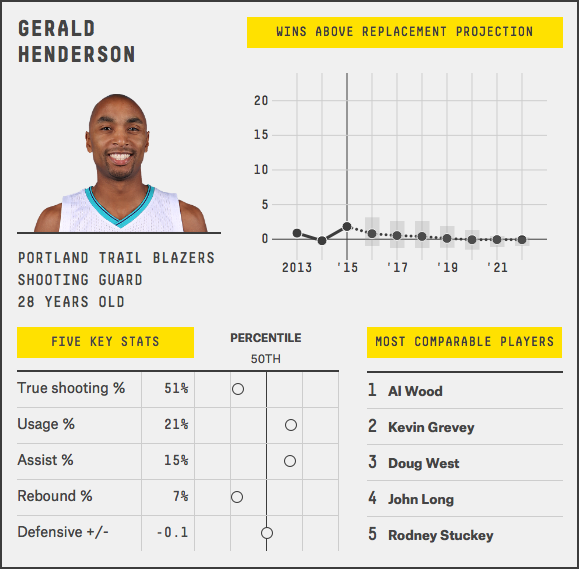 Gerald Henderson is not on top of most Blazers depth charts, but he is their most experienced shooting guard, having been a steady starter for Charlotte during the past four years — albeit of the below average/above replacement variety. Regardless, we expect him to get starting minutes in Portland, where he’ll likely be the same. 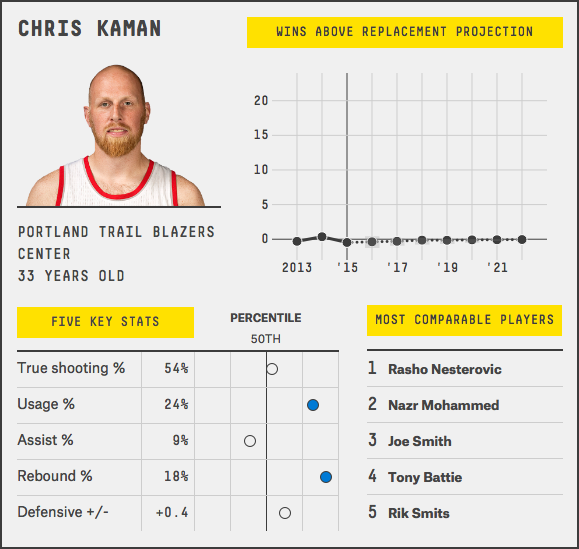 Chris Kaman is a former All-Star. No seriously, look it up. Note that he’s 33 and CARMELO expects him to improve slightly in the coming years — pretty much because it can’t fathom a below-replacement player remaining in the league for so long. 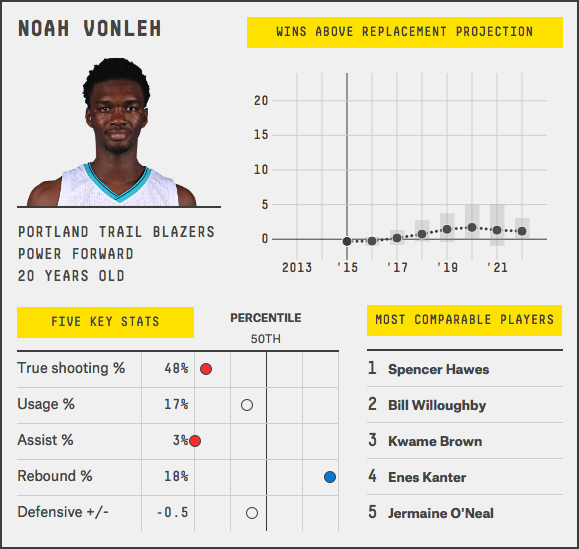 Hailed as the “likely eventual replacement for Aldridge at power forward,” Noah Vonleh scored 83 points and had four steals last year. In the following chart, we assume that in addition to the listed players, some portion of Portland’s minutes will be filled by generic players of “replacement level” quality — that is, the type of players who would be freely available off the waiver wire during the season.